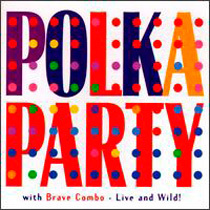 Brave Combo - Polka Party with Brave Combo - Live and Wild! This is not your average polka band. The Grammy® nominated dance band Brave Combo performs traditional and modern polka music with the power of rock `n' roll. One of the most exciting live acts on the road today, Brave Combo plays with wild abandon and an irresistible beat. Now you can experience the sheer energy of Brave Combo in concert with this all-new live album, recorded at polka dances in Dallas and Denton, Texas. Find out what everyone's talking -- and dancing -- about. Let's polka!